On January the 4th the European Association of Institutes for Vocational Training has set a new milestone and established its new office in Brussels. Located in the European Quarter the EVBB will continue to fly its flags for the support of vocational training and education. The office will be headed up by Horst Dreimann. The 62-year-old secretary general is an “old hand” who already has been moving in international circles for decades. He looks forward to the new task in the capital of the European Union. Whoever knows Horst Dreimann well will soon realize that he has a very special reference to Europe because of his studies. While working for the ‘Internationaler Bund’ (IB) he particularly approached infrastructure development projects and pursued actions under development cooperation in the recent years. Project management and third-party-funded projects are therefore familiar with him. It was always important to work with and for the people, no matter on which continent or which country he performed his duties. Making new discoveries and organize them usefully whilst going along changes or even pushing them forward has always motivated him. The change, the attraction of a new task. Therefore, there was no doubt about a ‘yes’ in regard to the request of IB CEO Thiemo Fojkar to send Horst Dreimann as a secretary general to Brussels. Why precisely Brussels? Quite an easy question. The EVBB as a European umbrella organization and its members want to strengthen vocational education and training, record trends for further potentials of improvement and become a key contact for the EU Commission. Therefore, it was very close at hand: The EVBB goes to Brussels. This is where the European music plays. What is happening on stage is known. But before “the artists” enter the stage, they have gone through quite a few dress rehearsals with those that want their piece put on stage. Here the Commission sets the course for European legislations and here the EVBB can be important, if not crucial for the way forward. This is why the EVBB has to be in Brussels. Of course, the EVBB is not the first association in Brussels and will not be the last one. But such a decision is not made without precise preparation. The decision to establish an office here in Brussels, was announced last fall. After all a suitable office had to be found. 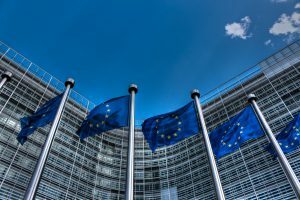 Thus, the association is now very centrally located near the European Commission sharing offices with colleagues from the European Vocational Training Association (EVTA). The key topics of the organization are thus better positioned. Some might think just establishing an office in Brussels is certainly not enough. You are definitely right. The EVBB now has nearly 60 member associations not only in Europe but also in Asia and in Africa. With respect to that it is quite important to provide all member associations with the necessary information published through the European channels and furthermore to give all of them a chance of getting their voice heard plus access to available project funds. Regarding this it is even more important to get an overview of who are the EVBB’s stakeholders in Brussels. First of all that means making rounds and rounds of conversations, phone calls and meetings. And after this period of “consolidation” the real work begins. Because one thing is clear. The target is to become a real door-opener to the European channels for the member associations on site in Brussels. And we will work towards that.